Look up 草履 or zōri in Wiktionary, the free dictionary. Zōri (草履) are flat and thonged Japanese sandals made of rice straw or cloth, lacquered wood, leather, rubber, or, most commonly, synthetic materials. Zōri are quite similar to flip-flops. 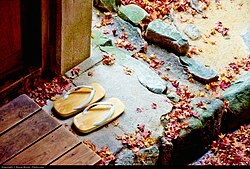 Like all Japanese sandals, zōri allow for free circulation of air around the feet, a feature that probably came about because of the humid climate that predominates throughout most of Japan. They are easily slipped on and off, which is important in a culture where shoes are constantly removed and put back on, and where tying shoelaces would be impractical in a tight kimono. The traditional forms of zōri are seen when worn with other traditional clothing; modern forms are fairly common, especially in summer. While geta are now mostly worn with the informal yukata, zōri are often worn with the more formal kimono. The formality of the occasion affects the choice of kimono and zōri. The bulrush covered zōri that resemble tatami mats are not used with kimono, but are considered working wear or matched with casual Western or Japanese clothing. They rank close to the wooden geta. The hanao, or thongs, are either white or black, depending on the occasion. One wears white-thonged zōri as formal wear, as opposed to wearing a black-thonged zōri for informal wear. Most occasions dictate that one should wear tabi. The hanao of informal zōri can be made of a velour-like material, as in the case of straw imitation zōri. The hanao for more formal coloured vinyl zōri are either thin vinyl or brocade straps, or wider and padded vinyl or fabric straps. The fabric is often either the fabric used for the shoe, or chirimen, crepe-like Japanese silk or rayon fabric. Men's zōri might also feature leather or leather imitation hanao. The hanao wear and stretch easily, and they sometimes call for replacing. Sometimes, hanao can be replaced through flaps of the sole. At other times, the hanao cannot be replaced. Women's vinyl (plastic) zōri are formal, but less formal than fabric, or sometimes brocade covered zōri, that are used with the most formal of kimono, for example, wedding and funeral wear. Men's zōri are often plastic straw imitation, with foam or cork soles. Women's zōri are seldom flat, except for the straw imitation zōri. The soles come in different thicknesses and angles. There are even modern zōri that are left uncovered by fabric or vinyl, and the shoe, except for the inner sole, is black, hard plastic with a non-slip outer sole. Usually the outer sole is gray, genuine leather.